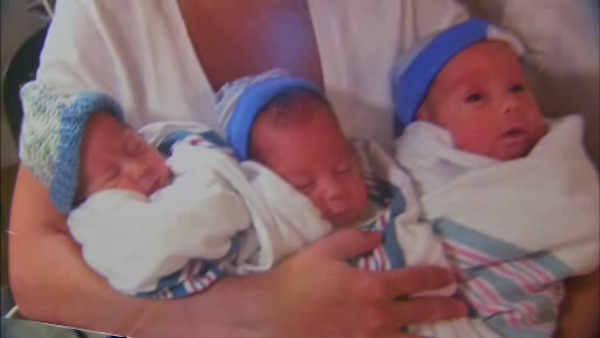 MINEOLA (WABC) -- A trio of newborns on Long Island is beating the odds. That's because the three boys are identical triplets. Owen, Noah and Miles were born to Jason and Kelli Fenley on July 1st at Winthrop-University Hospital in Mineola. Doctors say that only one in every 50 million births result in identical triplets. The proud parents said they are extremely grateful with the care they received. To tell the boys apart, the parents have color-coded them, painting a toenail of each a different color: blue, gray and green. They then dress the baby in that color. Kelli says last December, when she went to her ob/gyn she was informed she was having twins, she returned for a follow-up visit the next week and was in shock when doctors confirmed she was actually having triplets. The triplets birth weights were: Owen Michael, 2 lbs. 14 oz., Noah Charles, 2 lbs. 15 oz., and Miles John, 2 lbs. 12 oz. Kelly, 33, is an assistant school principal. Jason, who is 38, is an attorney. The Fenley's, who are residents of Brightwaters, also have a 2-year old son, Aidan. They have already traded in their truck for a minivan that can accommodate four car seats. The triplets are sleeping in one room with three cribs. Jason says he and Kelli purchased what he thought was a huge three bedroom two bath house in April of 2012, but he says they unexpectedly outgrew their dream house. Kelli says she will keep the boys on the schedule that the hospital created and bathe them every other night and feed them every three hours and put them down for naps immediately after they eat. Kelli's sister and mother-in law will provide hands on assistance.